The Solar maintainer in the pic below, is only for keeping this deep cycle battery at a full capacity charge. This charging unit is rated at 5-watts. What the 5-watt charge spec means is, that the Little Scampy battery must be at full charge before the Solar Maintainer is hooked up. Because a 5 watt solar panel is unlikely to recharge the deep cycle battery. We are going to do [this] to Scampy's manual tongue jack! 6:30pm - Powered Tongue Jack! Below is a pic of our plan to drive Scampy's tongue jack with an electric drill motor. The guys at the machine shop up on Bear Valley Road, will cut off the jack handle. 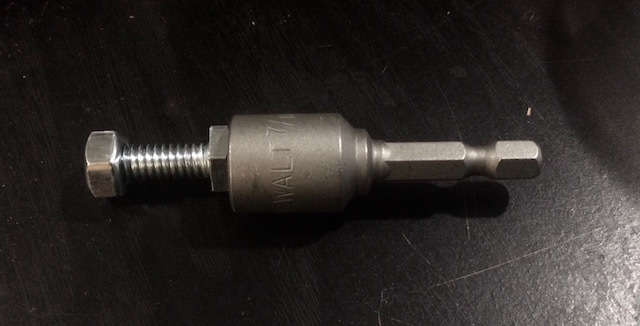 Then weld on the hex nut and bolt. I will drive the jack with my drill motor using the 7/16" x 1/4" hex driver shown in the pic. A great place to outfit a camper for cookware is a used item store, like Salvation Army or Amvets. And I love to go browsing thru that kind of store! 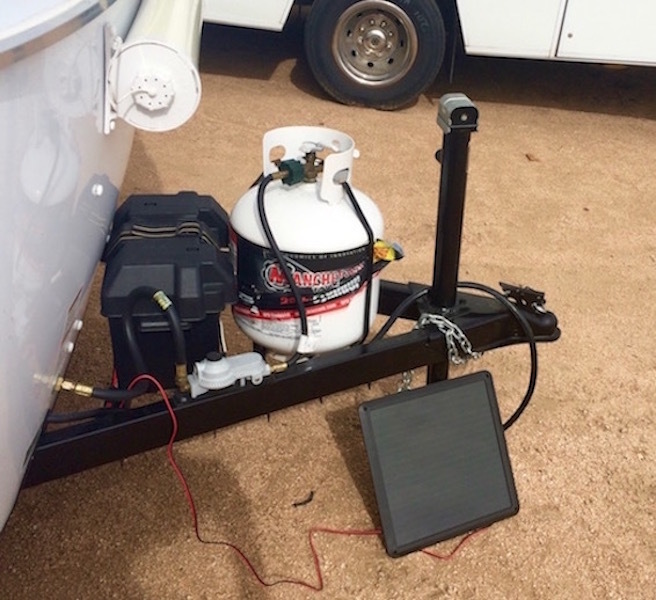 The solar panel will add charge to the battery no matter what the initial charge is and will eventually recharge the battery at a rate of about 0.4 amps taking over 200 hours of good daylight charge to get there if you do not discharge it by draining power off it. The battery does not have to be a full power before using the solar panel. One big drain on your battery are your indoor lights. You might consider getting LED lights to replace your 12v lights. I bought "GRV T10 921 194 24-5050 SMD LED Bulb lamp Super Bright Warm White AC/DC 12V -28V Pack of 2" at Amazon to replace the acorn lights on my trailer. Good info about charging the battery. Thank you! Good suggestion on the LED lights too! The jack idea is excellent. Waiting for your report, George. I assume your car is charging the trailer battery. 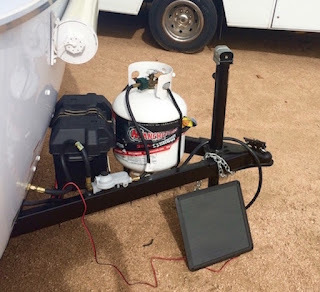 I would make the cable connecting the two long enough so that the tongue jack motor would run off the car charging system when connecting and disconnecting the trailer. I assume that motor draws a good amount of current. Just a thought. However, we are using a portable battery powered drill motor to drive Scampy's tongue jack. And all of us are sooooo excited about that! 1. Suggesting we buy a replacement jack that is motorized? 2. Just put some oil on the existing crank jack? 3. Neither of the above. You are commenting on stabilizer jacks. Not the tongue jack.